Since I’m obsessed with wearing one-of-a-kind pieces this is my personal version I crafted using a thrifted blazer from Talize. I painted some of it by hand, added my own buttons and trims, ironed on some embroidered patches, sewed on the heart elbows by hand and wrote some personally meaningful text that makes me happy. That is the great thing about keeping bits and bobs in your crafting studio, you have everything you need. I didn’t have to buy anything other than the blazer. It was a labour of love without a doubt. 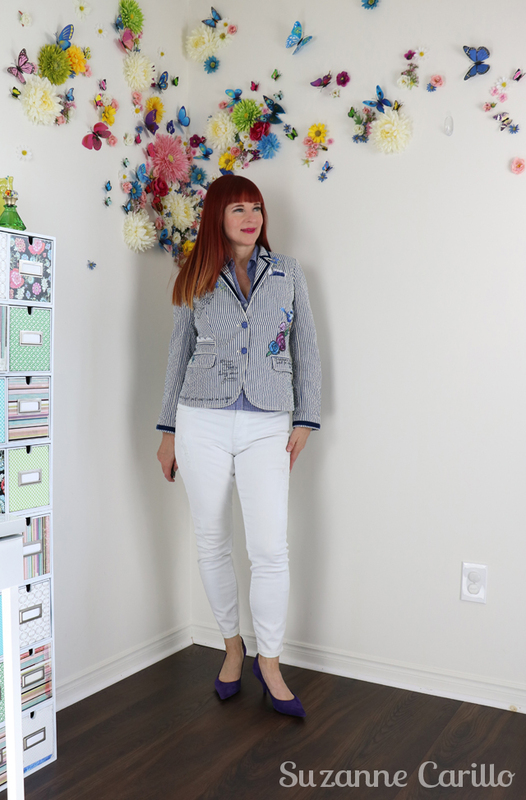 A great little DIY embellished blazer project that evolved over months. I started it way back when my sister and nieces visited last year. They created their own versions of altered jean jackets. I didn’t finish it at the time because I was too busy helping everyone else with their jackets. Thankfully the DIY bug struck again and I was able to finally finish it. A pet peeve of mine is unfitted projects so I’m really happy this one is done. I styled it first below and then I went back and added some more text. All items but shoes thrifted. Tomorrow is promised to no one. Only yesterday is a guarantee. I plan to keep adding text when the mood strikes. Either that or I’ll sell it. I haven’t decided yet. Sometimes when I create I find that like life, it’s the journey that counts and not the destination. 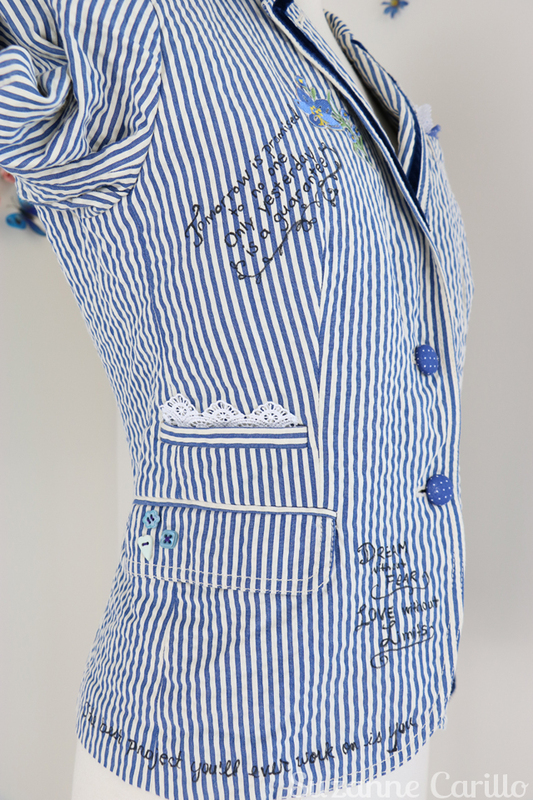 What text would you write on your blazer? 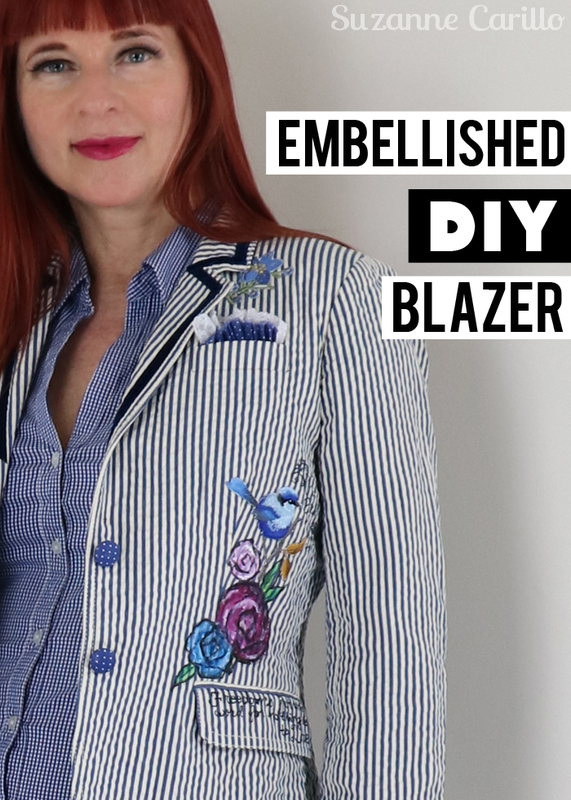 Your DIY blazer is much more appealing than the inspiration piece Suzanne. There is a refreshing sweetness in your embellishment choices. You’re going to run out of blazer considering the quantity of wonderful little wisdoms out there! woww, I think that your own version looks better than the desigual blazer, such a job of art! And I feel inspired to revamp some dull clothes in my wardrobe, I have to take them to the next level adding messages and patches and flowers!. So cool! Personal creations like this are so meaningful. And, yes, we learn and are rewarded when we exercise our creativity. This is a total work of art…your creativity skills are off the charts! I think you know by now I LOVE your embellished pieces. This is possibly the best by far, mainly because of all the phrases you’ve added to it, which must feel so good to wear. The little hearts on the elbows are the cherries on top. These projects you do always inspire me to try my own DIY projects. I’m still working on my “painted dress” but I have designs on a couple of boring blazers hanging in my closet. 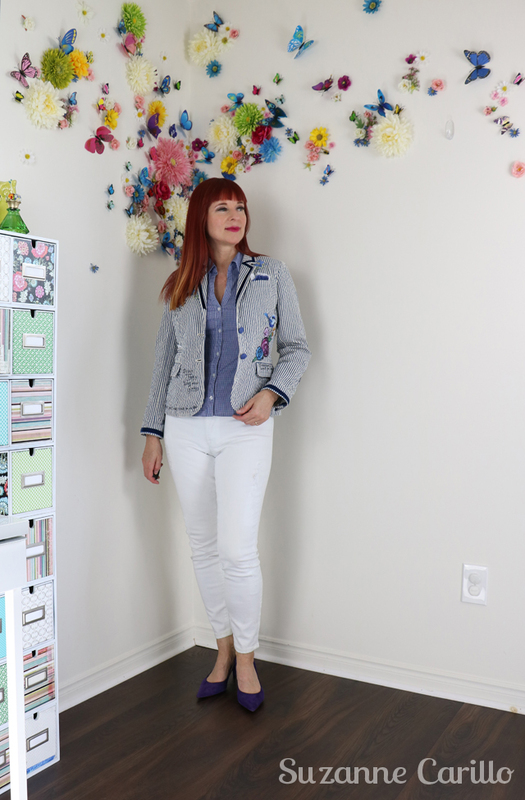 I always love your DIY skills and this blazer is no exception – I like it much better than the inspiration! this is awesome! 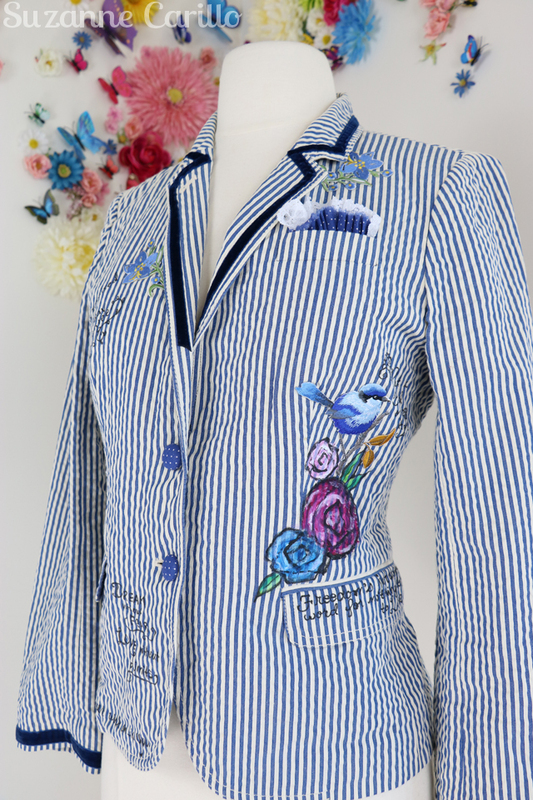 you´r so talented and the blazer is a piece of art – love that personal sentences! Gosh…this is fabulous Suzanne!! Especially now with embellishments and embroidery being so modern!! I always think I want to do something like this—and then I get realistic…ha ha!! You’ve made some wonderful embellished pieces and this is another to add to the collection. I especially like the heart patches on the elbows. I’ve had mixed success with embellishing clothing items – some things just looked better in my head than in reality! Amazing work. Your work is so clever and well done. Your jacket is much better than the one that inspired you. I really like each phrase that you chose and how clever of you to locate them where you dead. Wonderful styling also, of course. 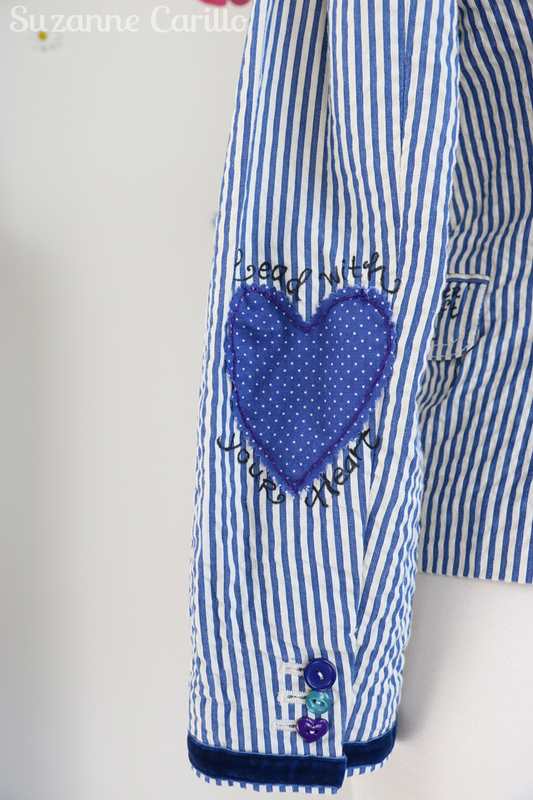 This one of a kind jacket will enhance any outfit, and you did it yourself! Bravo and Bisous. Or is it Brava ? I’m glad that this undone project turned out so brilliantly. The journey, I agree, but the finished work can be so satisfying too. This is better than your inspiration piece. I’d love to go to one of your workshops as a niece-of-the-day. Hahaha! Sometimes it’s more fun to create together. You are very good at this craft. Making unique pieces. I’m curious what kind of pen you used for the writing. It’s a fabric ball and brush dual tip marker by Marvy Uchida. I highly recommend it. You did a great job! I also like patches and adorning stuff. Or up cycling or whatever you call it. The slogans you wrote on the blazer are fab as well. I like Iris Apfel’s slogan: more is more, less is a bore.